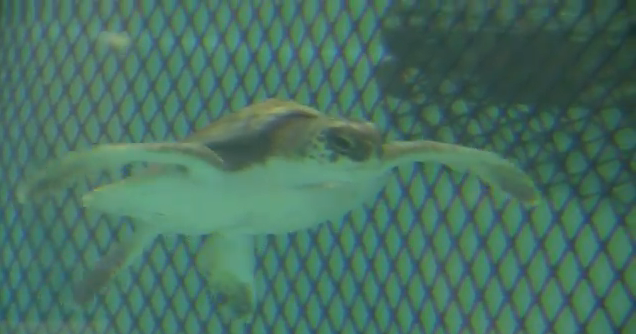 Video of green and Kemp's ridley sea turtles in rehab! Thanks for tuning in to our sea turtle crisis 2010 blogs. Rehabilitation efforts are going well at our new sea turtle hospital in Quincy, Ma. Below are two short videos of some of our patients in rehabilitation - enjoy! We have several green sea turtles together in this swimming lane. Can you spot them? Most of our patients are Kemp's ridley sea turtles. Notice how some of the turtles in this video are resting at the bottom, that's quite normal. These turtles look calm and their swimming patterns are normal and not frantic. When first introduced into the tanks some of the turtles can be a little frantic until they swim around the tank a few times and get the "lay of the land" so to speak. #100 had only recently gone into the isolation tank you see him/her swimming in during a segment of the video. #100 was in very poor condition upon intake exam but is now progressing slowly. Our first loggerhead came in on Wednesday. This animal was in very poor condition and unresponsive. We administered emergency medications and were able to revive him/her. I'll post some pictures tomorrow. Thanks again for all the supportive comments and to those of you who "texted" for turtles - every little bit helps us with this crisis. How big is the loggerhead? Glad hear your efforts are saving the turtles! And thanks for posting the video... its very good footage considering its capturing underwater movements!